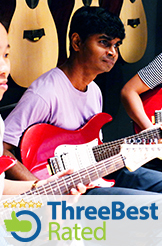 WDI will ground you with mastering the use of effects pedal along with the familiarization of use of the capo. This will set you on a path of greater playing freedom in playing different keys and expression through dguitar sound effects. xperience, use the Online Course Allocator to identify the module most suitable for you. All Training Rooms are fully equipped with practice guitars. Our Training Centres are conveniently located at International Plaza - Flagship (beside Tanjong Pagar MRT station), One Commonwealth (beside Commonwealth MRT station), and Tampines Plaza (beside Tampines MRT station).